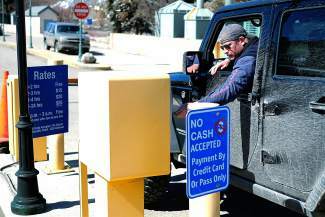 A visiter pays for parking at the Village Parking Structure in Vail on Wednesday. Skier visits at Colorado resorts grew 11.9 percent, Vail Resorts said Wednesday. $19.7 million: Increase for 2013-14 in Vail Resorts total lift revenue over the same period in 2012-13. $85 million: Projected capital spending across the company for the 2014 fiscal year. 100 percent: Increase in Vail Resorts quarterly dividend payment to shareholders. 73 percent: Decrease in annual snowfall at Tahoe through Jan. 31, compared with the previous year. BROOMFIELD — We all know the power of snow. Vail Resorts can put that power into numbers. Company CEO Rob Katz hosted a conference call Tuesday to go over the company’s second quarter performance from Nov. 1 to Jan. 31 of this year. With the exception of the company’s resort in the Lake Tahoe area, the news was all good. The news was good enough that Katz announced Vail Resorts would increase its per-share dividend by 100 percent. For stockholders as of April 1 of this year, the new dividend is 41.5 cents per share. That dividend will be payable on April 16. Driving that announcement was improving performance across the company’s operations, from season passes to real estate sales. For the quarter ending Jan. 31, the company announced a net income of $59.3 million, a 2.1 percent decrease compared to the previous year. That decrease in income is attributable almost entirely to the historic drought that has hit the California mountains. Snowfall is only about one-quarter what it was the previous season, and visitation at Tahoe has declined by 27 percent. Katz described real estate sales in the quarter as “strong,” since the company closed on three units at One Ski Hill Place in Breckenridge and five at the Ritz-Carlton Residences in Vail. Skier visits at Colorado resorts grew 11.9 percent. In lodging, “revenue per available room” increased by more than 12 percent, led by resorts in Colorado and Utah. Katz also announced that the company would spend roughly $85 million in capital improvements this year, with about $50 million dedicated to maintenance. The company plans to maintain that level of spending into future years, too. For the first time in several years, there are no big plans for Vail. The capital plan at the company’s flagship resort for 2014 includes on-mountain maintenance and the renovation of 56 rooms at the Lodge at Vail. Beaver Creek’s Centennial lift will be replaced by a combination lift that includes both chairs and gondola cars. The new lift will increase uphill capacity at Centennial by roughly 30 percent. Katz said the new lift will allow beginners and families to ride to terrain at the top of the mountain. A new lift is also in the plans for the Colorado Chair at Breckenridge, another project that will increase uphill capacity at the base of Peak 8 by nearly one-third. Capital spending for this year also includes the renovation and expansion of the on-mountain restaurant at The Canyons resort in Utah. That resort, which Vail Resorts leased about a year ago, is embroiled in litigation with Park City Mountain Resort. Katz said there are a couple of hearings on that case scheduled for the end of this month and early April, with rulings from the case judge expected 30 to 60 days after those hearings. While Katz said the litigation has been more expensive than originally planned, The Canyons’ economic performance is generally keeping up with original expectations. “We feel very good about how the resort has performed,” he said. The company’s capital spending plan doesn’t yet include the Epic Discovery summer program. The first phase of that program at Vail is still waiting on U.S. Forest Service approval. Despite the California drought, company chief financial officer Michael Barkin said overall visitation across the company has increased 0.2 percent so far this season. Given the declines at Tahoe, that means solid gains at the company’s other resorts. Felicia Hendrix, an analyst with Barclays Capital, asked Katz if the California drought might have lingering effects on visits to Tahoe next season, given that resort’s status as primarily a day or weekend-trip resort. Katz said the drought could hit pass sales for Tahoe, but said visitors to that resort should return if the snow returns. Closer to home, Joel Simpkins, a Credit Suisse analyst, asked Katz when the company might see enough momentum to pursue the Ever Vail project. “We need a greater velocity of sales,” Katz said, adding that the company also owns developable land at Breckenridge and Keystone. Those smaller projects, which Katz said don’t have Ever Vail’s “infrastructure needs,” may be developed before the big project at Vail. While the earnings call came after the close of Wednesday’s trading on the New York Stock Exchange, Vail Resorts stock closed at 71.29, up 0.13. Tuesday, JMP Securities’ analyst Robert LaFleur issued a note to investors reiterating that company’s “outperform” rating for Vail Resorts’ stock. The company will also host its annual analyst and investor days March 18 and 19.